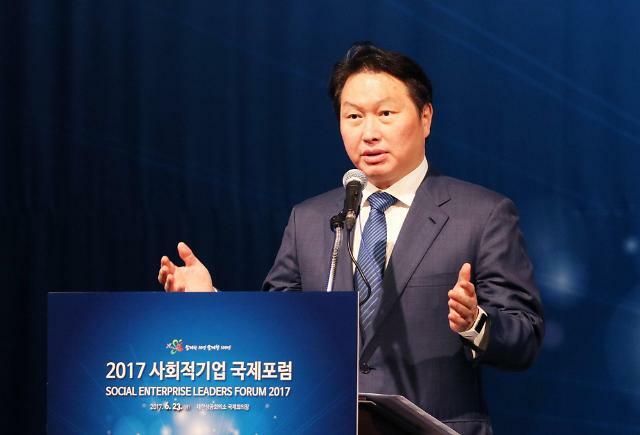 SK Group Chairman Chey Tae-won has filed a request with a Seoul court seeking a divorce settlement with his wife Roh So-young, legal sources said. The settlement request was lodged with the Seoul Family Court on Wednesday, with the date for a hearing on the mediation yet to be decided, according to the sources familiar with the matter. Chey, who runs South Korea's third-largest conglomerate, has only made the request for divorce and an asset division was not included, the sources said, as the latter is added to the process once an agreement is reached. Chey, 57, has publicly expressed his intention to end his 29 years of marriage in a rare open letter published by a local magazine in 2015, in which he revealed that he has a son born out of wedlock. He admitted that the relationship with his wife has grown "far too distant for more than 10 years" and that he met someone "who comforts his heart" when he was considering divorce and now has a child with her. But their divorce is much more likely to be proceeded by a suit since Roh has reportedly refused to divorce him, although they have long been separated. Chey and Roh married in 1988. Roh is the daughter of former South Korean President Roh Tae-woo, who led the country from 1988-1993. They have three children.